What Parts of an Artichoke Should You Eat? If you've never eaten a whole cooked artichoke before, it can seem daunting at first. You're faced with an admittedly odd-looking vegetable with rows of petals sometimes topped by tiny thorns, surrounding a hairy center and, beneath that, the delectable heart. So what exactly do you eat and what do you throw away? The process of eating an artichoke isn't as intimidating as it appears at first glance. Here's how to go about eating an artichoke. It is a relatively easy process and only requires 10 to 15 minutes (not including cooking time). You'll want a spoon, some napkins, a bowl for garbage, and dip or melted butter is optional. Begin with a cooked artichoke. It can be either cold or hot. Starting at the base of the artichoke, pull off one petal. It should come off easily if the artichoke has been properly cooked. (If it is very hard to remove, the artichoke will need to be cooked for a longer time). Draw the base of the leaf, at its widest part, through your teeth to scrape away the soft fleshy portion. When you're done, discard the rest of the leaf. Continue pulling off and eating the leaves one at a time. They'll become tenderer as you progress upward from the base and will offer larger edible portions as you go. Eventually, you will reach the choke, which is the undeveloped flower at the center. Remove and discard the choke by scraping a teaspoon along the top of the choke. You'll recognize it by its fuzzy, hairy appearance. This part is inedible. What remains is the artichoke's bottom or "heart," which is delicious. Cut it and eat it. Prepare and cook an artichoke by snipping off the thorny tips at the top of the petals and removing the little stubby petals at the base. If the stem is particularly long, you can cut half of it away as well. Rinse the artichoke well, then steam it. Fill a pot with water and aromatics of your choice (lemon and a bay leaf are a nice combination) and bring it to a boil. Then place the artichokes in a steaming basket and place the basket over the water. Steaming can take as long as 45 minutes, depending on the artichoke's size, how many you're cooking, and whether they're crowded in the steaming basket. You'll get rid of those little thorns at the tips of the petals when you prepare the artichokes for cooking, but if you miss some, it's fine. Cooking softens them so they won't hurt your fingers. Avoid purchasing "thornless" artichokes. The cultivation process tends to make them skinny and less flavorful. Artichokes leaves are often enjoyed by dipping them into melted butter, garlic butter, or mayonnaise before eating. Peeled and cooked artichoke stems are fully edible. Eating the hairy choke can cause a choking hazard. Baby artichokes are completely edible. Enjoy both the leaves and choke. Artichokes burst with nutritional goodness. They have high levels of dietary fiber (more than twice that of a cup of cooked oats) and high levels of folic acid. Eating an artichoke provides more than 25 percent of the daily recommended allowance of folic acid. They're also a good source of Vitamin K, which is thought to promote brain and cognitive health. 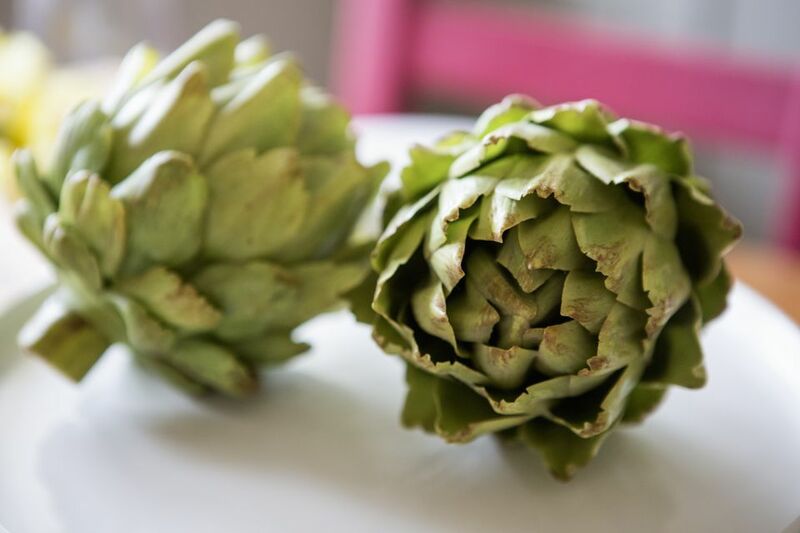 Studies have shown that consuming artichoke leaf extract reduces "bad" LDL cholesterol.